Chadhiyana #1 was officially been out for a week (through Rosarium Publishing), but there’s still more to come. Late last week, the first issue of Chadhiyana: In the Company of Shadows was added to comiXology.com and even earned a mention on the comiXologist post-San Diego Comic-Con podcast! More, this weekend begins a three-week-straight convention tour for Chadhiyana and myself. First, comiXology released the first issue on Wednesday last week (comixology.com/Chadhiyana-1/digital-comic/239164), just two days after the scheduled release. I was unfortunately fighting off stomach pains for much of the week, so I completely missed this until artist Corey Breen (who designed the Chadhiyana logo) pointed it out on his Facebook page. That makes three distributors for the book now (including Amazon.com and IndyPlanet.com). What more, Corey also shared that Chadhiyana #1 was mentioned in the 449th episode of the comiXologist, Back in the Saddle Again. The comiXologist talks about new releases on comiXology.com and comic in general. Though Kara (one of the show’s hosts) pronounced the name wrong (no worries, Kara; its chah-di-yah-nuh not chat-ee-yaa-nuh), but she seemed to like the book and enjoyed the artwork all the same. For me, however, I thought it was great that she thought the book looked interesting enough to check it out and at least give it a mention on their podcast! If you want to listen to the episode, you can find it on iTunes (itunes.apple.com/us/podcast/comixologist-presented-by/id266108324). Again look for episode 449, Back in the Saddle Again. Chadhiyana is mentioned around 3 minutes into the podcast. If you don’t have iTunes, you can also listen to it on Stitcher (stitcher.com/podcast/comixologist/the-comixologist). Last but not least, this coming weekend I’ll be appearing in artist alley at the Garden State Comic Fest (July 25 and 26, Saturday and Sunday; gardenstatecomicfest.com) at the Mennen Arena in Morristown, New Jersey. This will be the first of three upcoming conventions this summer, all three of them back-to-back-to-back. Following GSCF, I’ll be in Boston for the Boston Comic Con (bostoncomiccon.com) and then again in the tri-state area for Inbeon Con: Summer Edition (inbeoncon.com) on Saturday, August 8th. That’s three conventions in three different states. If you’re a fan of my work or Chadhiyana, I hope these next few weeks will offer you the opportunity to catch me at least one show–especially if you’ve purchased a print copy and want to get it signed. Otherwise, it’s going to be something of a mini-book tour for me to get the word out about the first issue of Chadhiyana. That said, if you haven’t picked up a copy of Chadhiyana #1 yet, please do. As I keep saying (biased or not), it’s really a great book. I mean, even the comiXologist felt it worth mentioning! J. M. DeSantis is a writer and artist (Write-ist™) who’s work has appeared in diverse industries including prose fiction, comics, and even film. 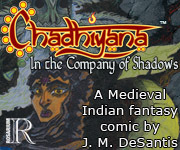 He is the author of a number of short stories, books, comics, and artworks, mostly in the fantasy, horror, and humour genres, and is the creator of the dark fantasy heroine, Chadhiyana (chadhiyana.com) and the web-comic Gentleman Cthulhu (gentlemancthulhu.com). Support his work through his Patreon at patreon.com/jmdesantis. Congratulations on all your success Jeff. See you at Inbeon. Thanks, Brendan! I’m looking forward to it. This site and all of its contents are the ™ trademark and © copyright of J. M. DeSantis, unless otherwise noted. All rights reserved.